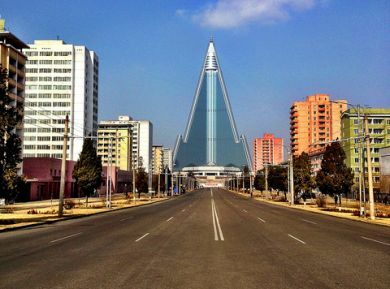 The Ryugyong Hotel in North Korea was designed to resemble a giant rocket which some believe was intended to serve as a symbol of the countries military ambitions. The world's most bizarre hotel has 105 stories and 3,000 rooms but to date, has never had a guest stay in it. Construction on the concrete hulk began in 1987 but stalled in 1992 when North Korea entered a period of economic crisis after the fall of the Soviet Union. The massive structure which looms over the skyline in Pyongyang is impossible to miss and is essentially a giant empty shell. The halt in construction, rumours of problems and the uncertainty of its future, led media sources to dub it "The Worst Building in the World", "Hotel of Doom" and "Phantom Hotel". While mocked-up images of the completed hotel had appeared on North Korean stamps during the initial construction period, the North Korean government chose to disregard the building's existence, during the construction hiatus. Even though it dominates the Pyongyang skyline making it impossible to ignore, the government at the time manipulated it out of official photographs and excluded it from printed maps. Today it still looms over the city of Pyongyang amidst rumours that there are plans afoot to resurrect the project.